A keyboard depicting note-color associations. 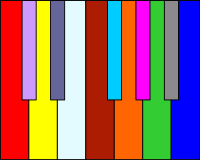 Note that the colors are experienced with the sounding of the note, and are not necessarily localized to piano keys. Chromesthesia or sound-to-color synesthesia is a type of synesthesia in which heard sounds automatically and involuntarily evoke an experience of color. For the purpose of disambiguation, this article will refer to this chromesthesia in inducer-concurrent terms used to describe other forms of synesthesia. With sounds inducing color concurrents, chromesthesia is more accurately termed sound-color synesthesia. Individuals with sound-color synesthesia are consciously aware of their synesthetic color associations/perceptions in daily life. Synesthetes that perceive color while listening to music experience the colors in addition to the normal auditory sensations that would be triggered in the average person. That is, the synesthetic color experience supplements, but does not obscure real, modality-specific perceptions. As with other variations of synesthesia, individuals with sound-color synesthesia perceive the synesthetic experience spontaneously, and without effort, and in a way that the individual learns to accept as normal within their realm of experience. The color associations, that is, which color is associated to which sound, tone, pitch, or timbre is highly idiosyncratic, but in most cases, consistent over time. Individuals with synesthesia have unique color pairings. However, all studies to date have reported that synesthetes and non-synesthetes alike match high pitched sounds to lighter or brighter colors and low pitched sounds to darker colors, indicating that there may be some common mechanism that underlies the associations present in normal adult brains. There are forms of pseudo-chromesthesia that may be explained by associations synesthetes have made and forgotten from childhood. As with other variants of synesthesia, sound-color synesthesia can be divided into groups based on the way the colors are experienced. Those that 'see' or perceive the color as being in the external space are often called projectors, and those that perceive the color in the mind's eye are often called associators, but these terms can be very misleading in terms of understanding the true nature of the experience. For most synesthetes, the condition is not wholly sensory/perceptual. For some individuals, the synesthesia is only triggered by speech sounds, while others' synesthesia can be triggered by all known auditory stimuli. In a study investigating variability within categories of synesthesia, 40% of subjects with synesthesia for spoken words reported that voice pitch, accent, and prosody influenced the synesthetic concurrent, whereas few subjects reported that volume or speed of talking had any influence. Within these subjects, many reported that the speaker's emotional inflection could influence the synesthetic color, but only two reported that their own mood had such influence. Of participants categorized as having synesthesia for music in this study, 75% reported concurrents exclusively when listening to notes being played. When asked whether the experience of the concurrent could be voluntarially controlled, only 33% of participants indicated an ability to smother, ignore, or willfully evoke their concurrents without great effort. Attention to the inducing stimulus was reported as influential in 59% of participants. Other contributing factors included concentration level, fatigue, sleep habits, fever, emotions, and substances, such as caffeine or alcohol. Sound-color synesthesia is far more common than color-sound synesthesia, although there are reported cases where sounds and colors activate bidirectionally. One individual, JR, sees colors when she hears sounds and also hears sounds when she sees colors. This type of synesthesia interferes greatly with daily life. This individual's associations were highly consistent over time, but the associations were not necessarily the same in either direction. There may be an effect of semantic mediation in some individuals with sound-color synesthesia. One subject, MH, self-triggered notes on a synthesizer and noted the color associations. When the synthesizer was transposed without her knowledge, she reported identical color associations to the notes that she believed she was hearing, rather than the absolute pitch of the tones. The exact mechanism by which synesthesia persists has yet to be identified. Given that synesthetes and non-synesthetes both match sounds to colors in a non-arbitrary way, and that the ingestion of hallucinogenic drugs can induce synesthesia in under an hour, some researchers claim it is reasonable to assume that synesthetic experience uses pre-existing pathways that are present in the normal brain. The causality of synesthesia is also unclear at this time, although evidence points to a genetic predisposition. Synesthesia is known to run in families, though the condition may present idiosyncratically within a family. Additionally, synesthesia may skip a generation. However, there are cases of monozygotic twins where only one has synesthesia, indicating there may be additional factors involved. Differences between synesthetic and non-synesthetic brains may reflect direct hard-wired connections between unimodal auditory and visual regions in the brain, or they may reflect feedback pathways from multimodal audiovisual regions to unimodal visual regions present in all brains. The cross-activation theory of synesthesia was formulated by V.S. Ramachandran and E.M. Hubard, based on converging evidence over studies of the various forms of synesthesia that sensory areas for processing real and synesthetic information tend to be neighboring brain regions. This is most apparent in grapheme-color synesthesia, because the brain regions for color processing and visual word form processing are adjacent. Individuals with sound-color synesthesia show activation of brain areas involved in visual processing, such as V4, immediately after the auditory perception, indicating an automatic linking of sounds and colors. The reason for this cross-activation is still unclear, but one hypothesis is that the increased connectivity between adjacent brain regions is due to a reduction in the pruning back of neuronal networks during childhood. The disinhibited feedback model provides an alternative to the cross-activation theory. The disinhibited feedback model rejects the assumption of increased connectivity in synesthetes and proposes that the cross-activation is due to a decrease of inhibition in the networks present in the normal adult brain. Disinhibited feedback could account for the fact that sound-color synesthesia can be acquired by damage to the retino-cortical pathway. Forward feeding connections in the brain that receive converging signals from multiple pathways are always reciprocated by feedback connections. In most people, these feedback connections are sufficiently inhibited to avoid synesthetic induction of a concurrent perception. In synesthetes, it is suggested that feedforward signaling in the inducer pathway could activate neurons to which both inducer and concurrent pathways converge, and that feedback signaling is capable of propagating down the concurrent pathway to activate the concurrent representation. By this mechanism, feedforward activity from the inducer leads to feedback activation of the concurrent representation. In addition to the high interconnectivity in synesthesia, there is an apparent contribution by the inferior parietal cortex during synesthetic experiences, possibly serving as the mechanism to bind the real and synesthetic perceptions into one experience. Parietal lobe activation is most apparent when the synesthete is directing attentional focus to the synesthetic experience. Functional magnetic resonance imaging studies also implicate the left superior temporal sulcus as being involved in the integration of auditory and visual information. This brain region responds most strongly to congruent pairs of visual and auditory information, such as congruent lip movements and heard speech. The literature contains several conflicting assumptions regarding the definitional criteria of synesthesia, which in turn may bias selection of research subjects and interpretation of results. Synesthesia has long been described as a 'merging of the senses' or as a kind of 'cross-sensory' experience; however, the condition is not purely sensory/perceptual in all synesthetic individuals. While this description of synesthesia is useful in describing the condition to laypeople, it should not be interpreted literally and used as selection criteria for scientific exploration. Another commonly used defining characteristic for synesthesia is that synesthetic associations are consistent over time. This is generally determined by having individuals report color pairings twice, with several months separating the test from the re-test. Consistency has been described as so fundamental to synesthesia that the test of consistency has become the behavioral 'gold standard' for determining the genuineness of the condition, and selecting subjects for research. This creates a circular bias, in which virtually all subjects in research show high consistency over time as they have been selected as such. While consistency, to some extent, may be characteristic of synesthesia, there are individuals that fit all other criteria of synesthesia, but report that their synesthetic associations are never consistent over time. Another misleading defining characteristic of synesthesia has been that synesthetic concurrents are spatially extended, and the individuals should be able to indicate a spatial location in which the concurrent is experienced. In the case of sound-color synesthesia, those who experience colored photisms from listening to music can often describe the direction of movement of these photisms. While the majority of synesthetes experience a spatial quality to the synesthetic experience, there are still many that report no such quality. In addition to definitional inclusion/exclusion criteria for synesthesia research, self-report bias is also likely relevant to many studies. This self-report bias, if it exists, would perpetuate itself because the condition would become defined by those cases that become known, and not by those that remain hidden. This is significant because many synesthetic individuals may exclude themselves on the basis of not fitting the prescribed definitional criteria. This is also significant to the extent that synesthetic individuals have a limited ability to differentiate their experience from that of nonsynesthetic individuals. A possible resolution of these issues would involve defining synesthesia on a neurological basis. Such a unifying neurobiological cause has yet to be found, but if it exists, it might allow us to expand our knowledge and inform us in ways that a behavioral definition might have otherwise failed to do. The proportion of synesthetes among artists is around twice as high as in the general population. Synesthetic artists tend to choose an art form where they may benefit from their form of synesthesia. Individuals with sound-color synesthesia are thus more inclined to play a musical instrument. However, musical experience does not assist the ability to consistently match colors to tones. Against natural expectation, studies have found that possession of absolute pitch increased local variance in matching ability. One possible explanation for this is that because absolute pitch is subject to chance error, occasionally incorrectly inferred note names could compete with the pitch-induced color on particular trials. Another possibility is that people with absolute pitch can label tighter pitch recognition categories than normal, introducing a greater number of category boundaries to cross between distinct tones. ^ a b c d e Head, P. D. (2006). Synaesthesia: Pitch-color isomorphism in RGB-space? Cortex, 42(2), 164-174. ^ a b c d e Ward, J (2006). Sound-color Synaesthesia: to what extent does it use cross-modal mechanisms common to us all? Cortex, 42, 264-280. ^ Calkins, Mary Whiton (1893-07-01). "A Statistical Study of Pseudo-Chromesthesia and of Mental-Forms". The American Journal of Psychology. 5 (4): 439–464. doi:10.2307/1411912. JSTOR 1411912. ^ a b c Goller, A., Otten, L., Ward, J. (2008). Seeing Sounds and Hearing colors: An Event-related Potential Study of Auditory-Visual Synesthesia. Journal of Cognitive Neuroscience, 21:10, 1869-1881. ^ a b c d e f Van Leeuwen, T. (2012). Modality and Variability of Synesthetic Experience. American Journal of Psychology, 125(1), 81-94. ^ a b c Grossenbacher, P. G., Lovelace, C. T. (2001). Mechanisms of synesthesia: cognitive and physiological constraints. Trends in Cognitive Sciences, 5(1), 36-41.